You feel so excited as you have just received a brand new Windows Phone. You start exploring the phone in almost all the corners. 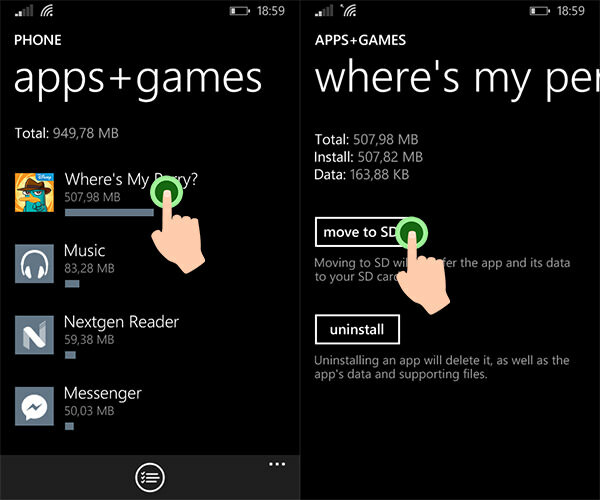 You have already installed many apps which appear on the start screen. You’ve get used to the gestures, and eventually also find some hidden features. Yet, with all the features that ship in Windows Phone, there’s a chance that you have missed a couple of handy tricks and useful settings to configure and tune up your Windows Phone. 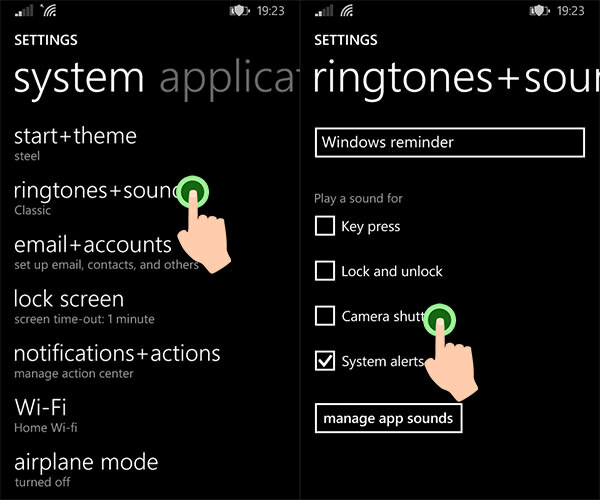 So, here are 10 tricks and settings that you should know to get the most out of Windows Phone. Let’s check them out. 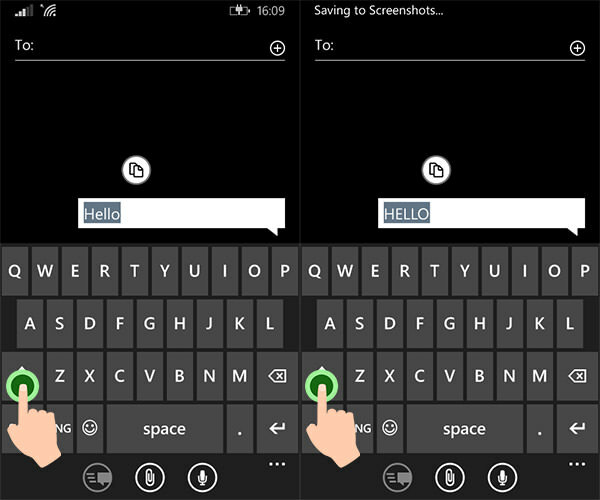 Typing in Windows Phone can be so much faster, if you know this little trick. For example: while typing, you may highlight a word and tap the Shift key to capitalize the first letter. Tap it a second time and it will capitalize the whole word. Holding down the Shift key will turn on the caps-lock mode. Windows Phone handhelds ship with 3 physically sensitive buttons – namely the back button, the home button (which is depicted with the Windows new logo) and the search button. These buttons will vibrate as you tap. If you feel that the vibration is kind of annoying or you simply want to switch it off for whatever reason, go to Settings > Touch and turn off the Navigation Bar. Windows Phone has finally come with an Action Center that stores app notifications as well as a couple of shortcut settings for quick access. To view the Action Center, swipe your finger from the top edge of the screen down to the bottom. Alternatively, halt your finger at the middle to only view the shortcuts. 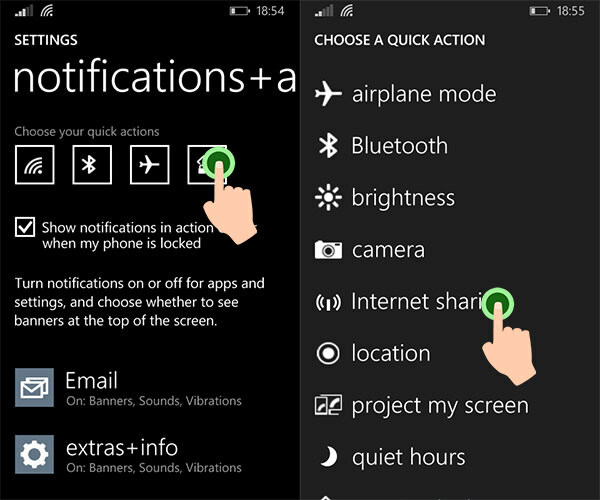 There are 4 shortcuts present in the Action Center, but a Windows Phone with a wider screen will have 5. Configure the shortcuts with ones that you frequently need most with Settings > Notification+action menu. Tap one of the current shortcuts, and select another on the list as the substitute. You can remove a notification in the Action Center by swiping your finger from the left to the right of each notification item. But, sometimes you can have heaps of notifications that will tire your fingers out. In that case, use 2 fingers to swipe all of them away in one swift motion. One of the best things about a Windows Phone is that the storage capability is upgradable with an SD Card for up to 64GB. You can store files, images, videos, and even apps in the SD Card instead of within the internal storage. So, if you have an app that takes up a lot of internal storage, it’s better to move it into the SD Card. To do so, go to Settings > Storage Sense. Tap the app+games and select the game. You will find the button to transfer it to the SD Card. Note: This button will only appear if you have your SD Card installed. When taking a picture or taking a screenshot of the phone, you will hear the shutter sound that is similar to the sound a real camera makes . Did you know that you can turn this sound off? If you don’t want people around you to notice that you are taking pictures, go to the Settings > ringtones+sound and untick the Camera shutter. Cortana, though in Beta, is very capable and and up to par with its competitors. 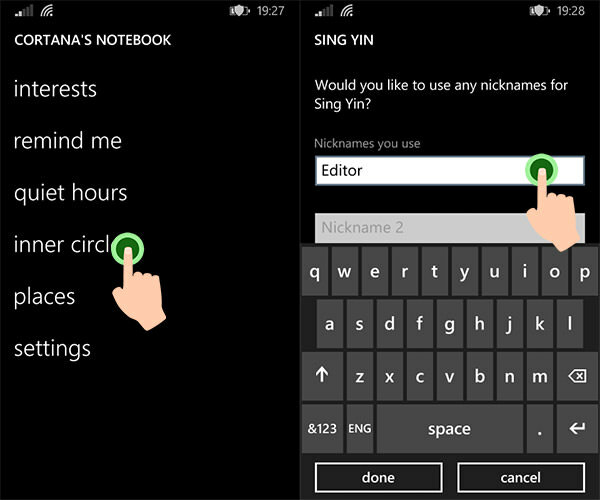 Cortana can help you call or text a specific person by calling his/her name. Alternatively, you can also call the nickname. So, instead of call “John Doe”, you may simply tell Cortana to call “Driver” (if he really is so). Go to the Cortana’s Notebook. Then, select the Inner Circle option and select the the person from the contact list to be assigned for a nickname – you can assign up to 3 nicknames. Cortana’s Notebook is where Cortana learns about you. Therein, aside from the Inner Circle, you can specify your Interest and Favourites as well. You can project Windows Screen to a TV or to your PC screen. 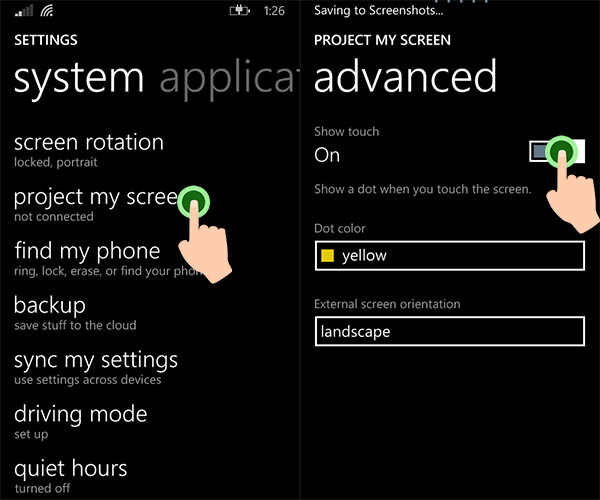 This can be very useful for creating screencast tutorial and demonstrating Windows Phone in a presentation. To do this, you will have to install Project My Screen. Connect Windows Phone to PC with USB, and start projecting the screen through the Settings > Project My Screen. 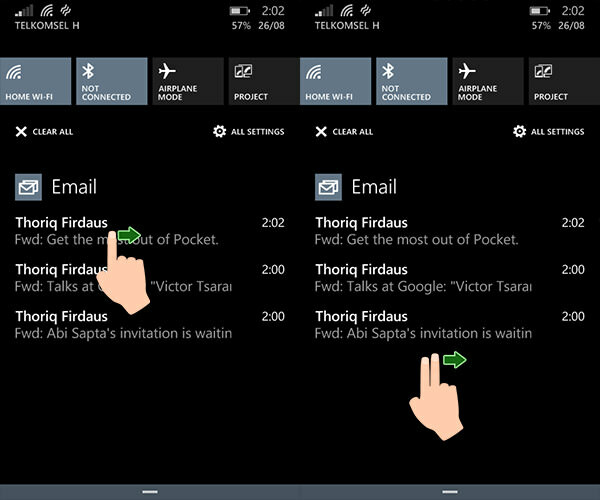 Additionally, turn on the Show touch option to show your finger position on the PC screen with a dot. Note: This is only applicabale in Windows Phone 8.1. Windows Phone is built with accessibility in mind. 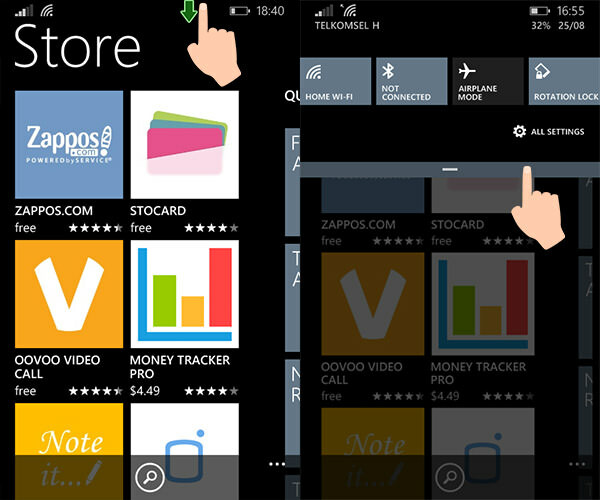 People with vision disabilities can use Windows Phone through the Narrator function. The Narrator will read aloud the text on the phone. I myself once enabled the Narrator, and it honestly freaked me out. Once this feature is enabled, some features are disabled, like Swiping, and I could not find my way back to turn it off in the Settings. At the end, I was able to sort it out. You can do it by holding the Volume button and tap the Windows icon at the same time.